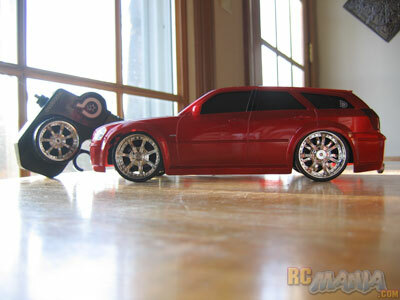 The following review was authored by long-time Ultimate RC community member stampede_dude. First of all, you should know that this vehicle isn't intended for someone who is looking for speed, agility, or for racing purposes. It is slow, manueverable, and entertaining, which are highly desired qualities for a young, entry level driver. 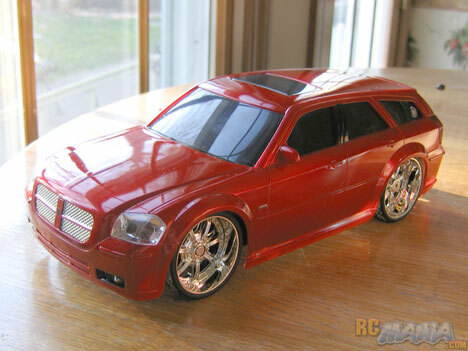 The body is very detailed, and is modeled after a Dodge Magnum. It is made of a strong lightweight plastic, and is well prepared to take the bumps and bruises it will need to endure during the mistakes made by an entry level driver. 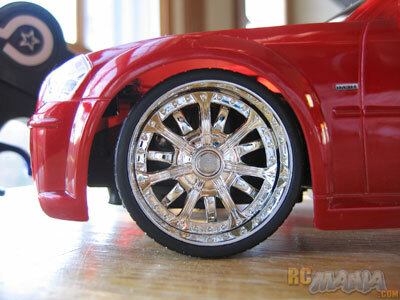 The wheels are modeled after "spinners," and they work fairly well for how small they are. 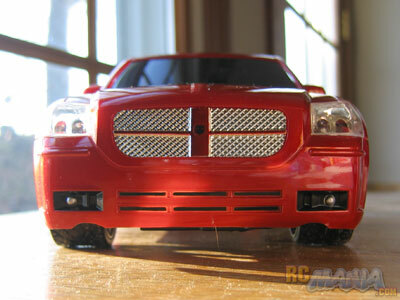 The car also has numerous lights placed around the vehicle under the body, simulating a similar effct comparable to that of ground effects on a real car. All these qualities make this vehicle very visually desirable. After following the included instructions, the first thing I did was to take the 3 "AA" sized batteries out of the vehicle and put 2 of them in the transmitter. Nonrechargeable batteries are great for the transmitter because it requires far less power, meaning they will last exponentially longer in said transmitter than the vehicle, and rechargeable batteries loose power if they aren't used in about a week. The vehicle only includes only three out of four of the batteries needed, and it would be unwise to add another unlike battery anyhow. Rechargeable batteries, although unreccommended for the transmitter, are ideal for the vehicle itself. You can go to the local Wal-Mart or similar store and buy 4 "AA" rechargeables and the charger for just under $10 in the Digital Camera section, a tremendous deal compared to buying nonrechargeables, which would be largely outweighed by the life of the rechargeable batteries, when, if taken care of, can be recharged 200 times or more. They also last longer and provide more power for the vehicle than the average Alkaline battery. My first impressions of this vehicle were "Wow, this thing is slow." After playing with it for a while, the "music" that comes on every time the throttle is depressed got slightly annoying, the same ten second or so clip being played over and over. Likewise a small child would probably not take notice to this. Although it is slow, it is very easy to maneuver on flat surfaces, and doesn't even go fast enough to cause any damage other than a few scrapes or scuffs on impact with almost anything. All in all, this vehicle is definately not for the experienced hobbiest, but for the begging R/Cer. It goes slow, looks good, is easily maneuverable, and plays an almost catchy tune. All of these qualities make this vehicle the perfect begging rig for a small child. I tried, tried, and tried again to damage this vehicle in a manner that an average person could not be repaired, but it couldn't be done, short of intentional damage or dropping it from considerable height. 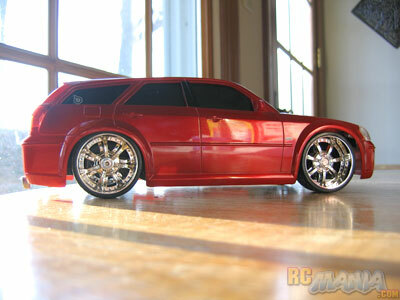 I am convinced that this vehicle is the perfect solution for anyone looking for an entry level vehicle for their child.